This card, here. This is the card, the one that has been generating so much conversation about Guilds of Ravnica, the one that takes everything the Golgari have become famous for and ramps it up to eleven. I can’t help but wonder if Standard would have had anywhere near as much of either the misery resulting from Teferi or the overestimation of Search for Azcanta if the order of set release had been a little different. Nothing is safe, and it has the same drawback as Path to Exile – which is to say, basically none. Being vulnerable to counterspells is kind of a disadvantage compared to Abrupt Decay, but its cost makes up for that: it’s cheap enough to get in early and also a great combination of colors to destroy the opponent’s hand and use up all their responses on deadly threats. Well, at least we can’t say they never make cards relevant to larger formats any more! Talk about another large format plant. Two mana, blow up anything an opponent controls. Not bad! 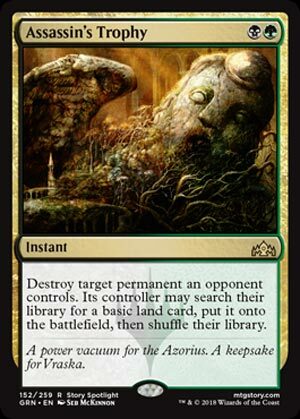 While it does replace the card with a basic land, you can use this to expunge almost any problematic permanent with little downside (especially in “larger” formats like Modern, where the land bases ask for a very tight fit of nonbasics). The land coming in untapped can occasionally burn you, but this is a premium removal spell that will see a lot of play across many formats.